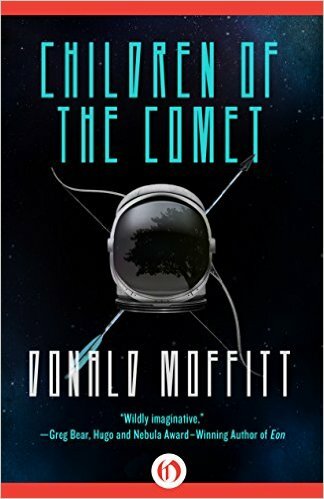 “Children of the Comet” eBook was published 2015 and was written by Donald Moffitt (http://www.donaldmoffitt.com/). Mr. Moffitt has written more than 20 novels. I received a galley of this novel for review through https://www.netgalley.com. I categorize this novel as ‘PG’ because it contains some scenes of Violence. This Science Fiction novel is set in a far future. Earth has been consumed by an expanding sun. Humanity has spread throughout the universe. Some of those who left to spread humanity through out the stars are coming home to the Solar System to see what is left. But their journey is not without their own internal squabbles. Torris is one of the evolved humans living on a comet. His way of life surrounds a giant tree growing from the comet. His is but one of thousands, perhaps millions of micro societies that have evolved. Torris encounters a female from another comet tree. They are enemies, but soon bond in friendship. When those Torris lives with find the the has friended an enemy, he is expelled from the comet. Luckily for him, he is found by one of the returning starships. This begins a story of closing cultures and the comet people taking a step towards civilization that they left far behind. This 332 page novel was a little odd. It was an interesting 5.5 hour read. I give this novel a 3.8 (rounded up to a 4) out of 5. My book reviews are also published on Goodreads.